The Cattedown Fuel Terminal is situated in the Cattedown area of Plymouth approximately 1.5 km south‐east of the city centre. The site is adjacent to the northern bank of the River Plym estuary. The site is bordered to the west and south by the River Plym and fuel storage tanks, to the east by further fuel terminal infrastructure and by the main site entrance and to the north by a high vertical rock face (supporting the South West Coastal Pathway) and additional fuel terminal infrastructure beyond the rock face. 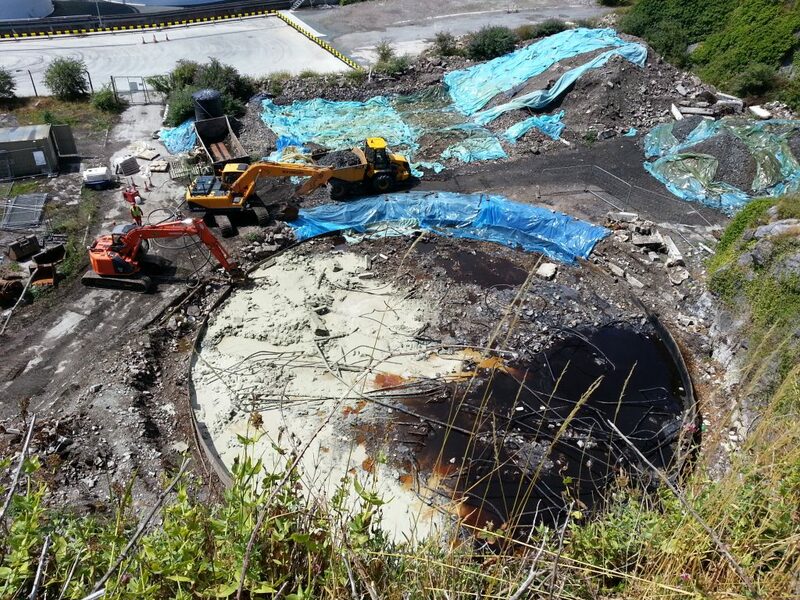 On acquiring the redundant bitumen storage facility, the client was advised that a previous tenant of the site had demolished a large bitumen storage tank in the 1970’s and that the bottom section of the tank remained in-situ and was effectively buried on site. Project Design Engineers [PDE] carried out a site investigation of the area to determine the location / size of the tank base and the nature of any residual material within the tank. The tank base was determined to be approximately 1.5m high with an overall diameter of 26m. Trial pits confirmed that the steel tank base had been left in-situ and that the void space within the tank base had been infilled with various spoil materials. The spoil materials were shown to be contaminated – the nature of the contamination was consistent with previous usage of the site for the production, storage and distribution of bitumen – the prime contaminants of concern were total petroleum and polycyclic aromatic hydrocarbons. Envirotreat was commissioned by Jones Brothers (Henllan) Limited [JBHL] to develop a remediation strategy to address the contaminated spoil materials within the tank base (and directly surrounding the tank base) – the total remediation volume was estimated to be circa 1,000m³. The remediation strategy was designed to address potential risks to human health and controlled waters (as identified in the site conceptual model). E-Clay Stabilisation was proposed for the treatment of the tank contents and surrounding soils. The remediation strategy was approved by PDE on behalf of the client. JBHL subsequently engaged Envirotreat to provide the remediation technology and necessary supervision to enable JBHL to undertake the remediation works. Envirotreat was also engaged by JBHL to obtain the necessary regulatory approvals from Plymouth City Council and the Environment Agency.